BOTTOM LINE: An enjoyable offering for this year’s Frigid Festival -- a lighthearted romantic play with music set in New York. When Broadway’s Jerry Orbach died, he donated his eyes. What if the men who received the eyes via transplant met and fell in love? This is the hilarious premise of No. 11 Productions’ The Eyes of Orbach, playing at the Kraine as part of this year’s FRIGID Festival. The story is framed by an eye doctor (the very funny Julie Congress) explaining the scientific aspects of sight to set up the plot. This includes an interactive eye exam, along with a little bit of background on eye transplants. This was a solid device used to begin the play. Eyes of Orbach also raises such relatable questions as: should you stay with your 9-to-6 job with dental insurance, or follow your dreams? The main characters, the receivers of Orbach’s eyes, are Paul (Steven Conroy) and Bill (Scott Raymond Johnson), who meet at a bar and recognize each other; they begin dating soon after. The story is peppered with cute Jerry Orbach jokes for the musical theater fans, as well as insider references like Dan Smith and Dr. Zizmor for New Yorkers to enjoy. The minimal set and props are creatively used to imagine Citibikes and boats in Central Park, as well as a food truck, with a clever name which I won’t spoil for you. Directed by Ryan Emmons with music by Aaron David Gleason, the show is funny, light-hearted and enjoyable, and moves along at a quick pace. A lot of the ideas presented are excellent, and the future of the piece is promising. 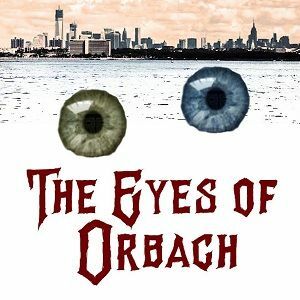 If you are looking for a funny play that celebrates New York and musical comedy, check out The Eyes of Orbach.